Research and development for a new generation frigate of project 22350M has begun in Russia, the CEO of Severnaya Verf (Northern Shipyard), Igor Ponomaryov, told TASS, in an interview. “We participate in this work together with the Northern Design Bureau, but the frigate’s parameters and their number will be determined by the Defense Ministry. Work is in progress. I do not believe that four ships will be enough for the Navy, which needs the replacement of its blue water ships,” he said. Ponomaryov earlier said the updated frigates of project 22350 will carry more powerful weapons and be capable of performing the functions of guided missile destroyers. The Navy’s Commander-in-Chief Vladimir Korolyov said the Navy hoped to have four project 22350 frigates by 2020. After that the project would be upgraded. According to the Chief of the United Shipbuilding Corporation Alexey Rakhmanov, these ships carry more weapons and more effective ones than the current project 22350. 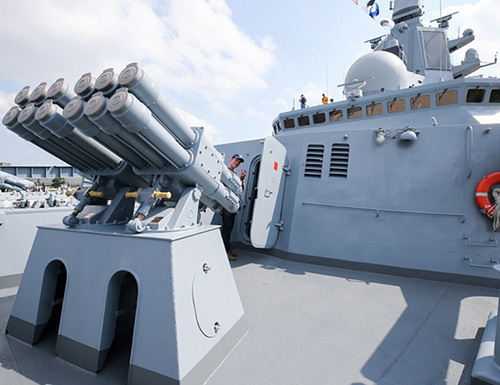 The Navy’s Deputy Commander-in-Chief for Armaments, Vice-Admiral Viktor Bursuk said the Navy would like to have the first upgraded frigate of project 22350M in 2026. In contrast to destroyers frigates have smaller displacement and less powerful weapons. Although the tasks of these two classes of ships are largely identical, destroyers have better weapons and radio-electronic equipment for independent combat operations. Also, destroyers can be used operate as leaders of attack groups.